A gardening blog about plants. Mostly. My home garden is in Monroe, Ohio. Officially in USDA hardiness zone 6a, we still, however briefly, have hit zone 5a lows in winters not to distantly past. The soil in my immediate vicinity is Eden silty clay. In many local developments, the good stuff has been scraped away and sold off as topsoil to some other poor schmuck who also had THEIR upper soil horizons scraped away. Whatever we had upon our arrival has been amended with horse manure, coir, and compost. There is no bed in my yard that couldn’t have been amended some more. 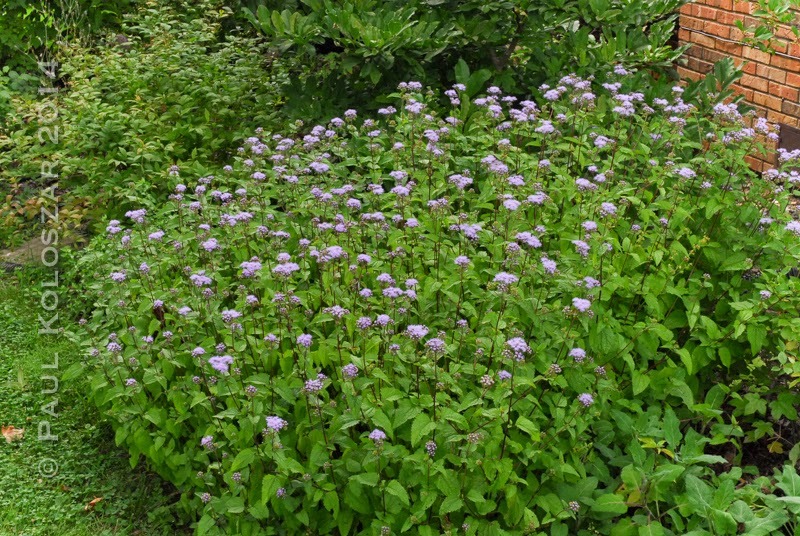 Conoclinium coelestinum, formerly known as Eupatorium coelestinum, may also be known by any of several common names: wild ageratum, hardy ageratum, blue boneset, blue mist flower, pink eupatorium. The last (the pink part, anyway) is a misnomer that likely arose from film-recorded images of the flowers. While the flowers are actually a lavender-blue, print and slide films images show them as pink; something to do with film's limited spectral sensitivity? If anyone can tell me the definitive answer why this is, I'd love to know. A shaded colony of Conoclinium coelestinum just coming into bloom. Evening light, earlier this week, on a smaller colony of blue mist flower. The first colony above is now a bit on the sprawly-falling-in-on-itself side of things, but still has flowers. All the same, it's due for a cutting-down before the seeds start forming in earnest. Like those of many other members of the aster family, hardy ageratum seeds disperse on the wind via fluffy pappi (plural of pappus) reminiscent of hairy parachutes. Shearing the plants now, rather than letting the few blooms sputter on, will reduce the number of unwanted seedlings popping up elsewhere. While we're on the topic of unwanted spreading; the astute reader has noted my use of the word colony. 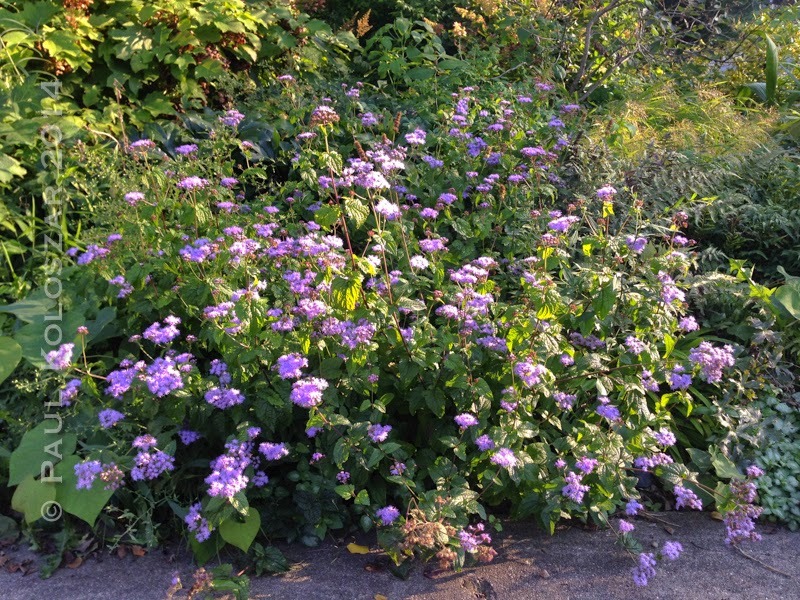 Hardy, or wild, ageratum does move about via rhizomes and can eat up a fair chunk of space in the garden where one is not mindful of marauding sprouts. In spite of its tendencies to wander, I appreciate hardy ageratum for the color it gives shady/partly-sunny spots at a time of year when many other blooms are spent. Consider pairing it with some large-leaved hostas for a textural contrast, as well as a vigorous partner which can keep up with it. Except where otherwise attributed, this work by Paul Koloszar is licensed under a Creative Commons Attribution-NonCommercial-NoDerivs 3.0 Unported License.